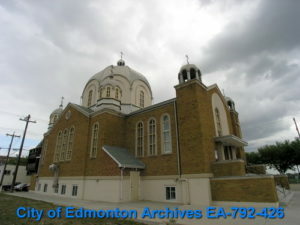 The first Russian Orthodox missionaries arrived in Edmonton in 1897 via Alaska. They worshipped in a number of buildings, but by the 1950s, the growing parish needed a larger space. This Byzantine-style church on a traditional cross shape foundation is roofed with cupolas representing heaven – the largest a reminder that Christ is the head of the Church.